Size of this preview: 800 × 508 pixels. Other resolution: 1,454 × 923 pixels. English: An example of an e-portfolio built using Mahara. This one is on the open source library management system Koha. I, the copyright holder of this work, release this work into the public domain. This applies worldwide. 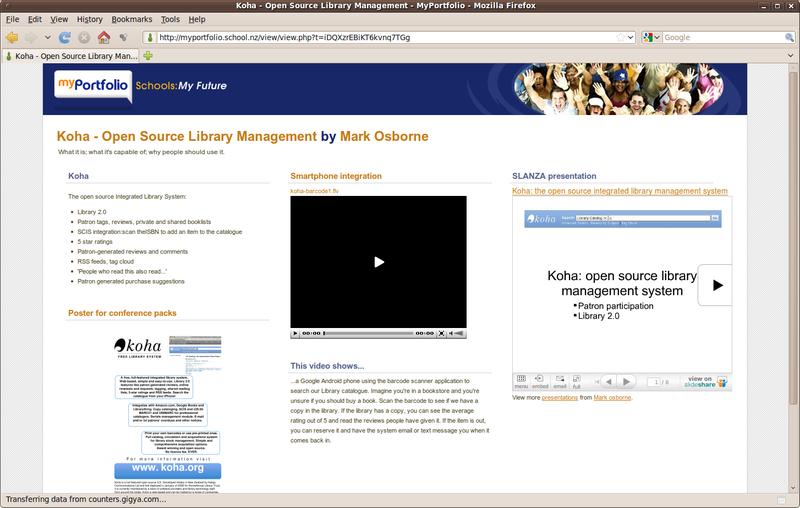 Mosborne01 The software used this screenshot is Firefox, Mahara and Koha, all of which are released under the GPL. Wikimedia has received an e-mail confirming that the copyright holder has approved publication under the terms mentioned on this page. This correspondence has been reviewed by an OTRS member and stored in our permission archive. The correspondence is available to trusted volunteers as ticket #2011012910013025.
current 23:15, 8 July 2015 1,454 × 923 (199 KB) Cmdrjameson Compressed with pngout. Reduced by 83kB (29% decrease).